Casual Hosting (CH) – All Casual Hosting menu items come with disposable dinnerware and a buffet host. Full Service (FS) – All Full Service menu items come with preset tables, chinaware, and full service staff. The waffle station includes an assortment of syrup, berries, and chicken. 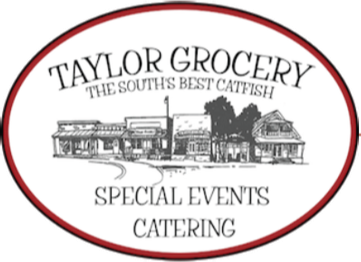 Includes everything on the Taylor Country Breakfast with the addition of pancakes with syrup, oatmeal, yogurt with toppings, and fresh-cut fruit. Our Omelet Station is also included. A country boy’s lite breakfast featuring fresh-baked buttermilk biscuits stuffed with either a whole hog sausage patty or a slice of applewood bacon, sawmill gravy, assorted mini pastries, mini muffins, bagels, scones, fresh-cut seasonal fruit, and orange juice. Fresh-baked assorted pastries and danishes, assorted mini muffins, bagels, scones, fresh-cut seasonal fruit, and orange juice. All simply southern hosted lunch buffets are served with your choice of three sides, dessert, bread, iced tea, and lemonade. Hand-breaded fried tenders and grilled tenders marinated in a zesty sauce. Grandma’s favorite Sunday dinner: fried bone-in chicken and BBQ smoked chicken. Slow cooked pig meat aka pulled pork smoked with a hint of pecan wood. By upgrading to chinaware, a 20% service staff fee will also be charge. Each box contains a sandwich, bag of Lays chips, fresh baked cookie, mayonnaise, mustard, lettuce, sliced tomato, fork, wet napkin, and a peppermint. A garden-fresh blend of tender, colorful lettuces and grape tomatoes, cheese, croutons, and a side of our homemade creole ranch or creamy vidalia onion dressing. Our house salad served with a scoop of our very own smoked chicken salad and two-cheese pimento cheese. Slowed cooked pecan smoked pig meat served with our homemade sauce, slaw, Lays chips, and fresh baked cookies. Marinated boneless chicken breast served with all the condiments, slaw, Lays chips, and fresh baked cookies. Slowed cooked pecan smoked pig meat and a marinated boneless chicken breast, served with our homemade sauce, slaw, Lays chips, and fresh baked cookies. Your choice of three different types of sandwiches, pasta salad, house salad, condiment tray, and fresh baked cookies. Our very own smoked chicken salad, two-cheese pimento cheese, house salad, pasta salad, potato salad, bread sticks, and fresh bakes cookies. The all-American picnic: 100% all beef 1/3 lb beef patty and all beef hot dog served with all the fixings’, buns, Lays chips, and a fresh-baked cookie. Big ole’ taters served with diced ham, turkey, bacon bits, chili, whipped butter, sour cream, green chivies, cheddar cheese, and chopped broccoli. The potato bar features big ole’ taters served with diced ham, turkey, bacon bits, chili, whipped butter, sour cream, green chivies, and chopped broccoli. To pair, enjoy a blend of colorful lettuces with grape tomatoes, cheese, croutons, and a variety of dressing served on the side. Includes coffee, iced water, and soft drinks. The only way to start the day. Scrambled eggs, applewood smoked bacon, whole hog sausage patty, buttermilk biscuits, sawmill gravy, southern grits, breakfast potatoes, and juice. A country boy’s lite breakfast featuring fresh-baked buttermilk biscuits stuffed with either a whole hog sausage patty or a slice of applewood bacon, sawmill gravy, assorted mini pastries, mini muffins, bagels, scones, fresh- cut seasonal fruit, and orange juice. Slowed cooked pecan smoked pig meat served with out homemade sauce, slaw, Lays chips, and fresh baked cookies. All Banquet Buffet Services and Plated Services include a higher level of service with preset tables, china service, and service staff. All buffets include a preset table with salt and pepper shakers, pitchers of tea, and iced water. Each place setting includes a preset salad, preset dessert, glass of ice, and silverware. Served with your choice of entree, preset salad, preset dessert, two sides, and beverage. Combine any two of the above side stations at no extra charge!